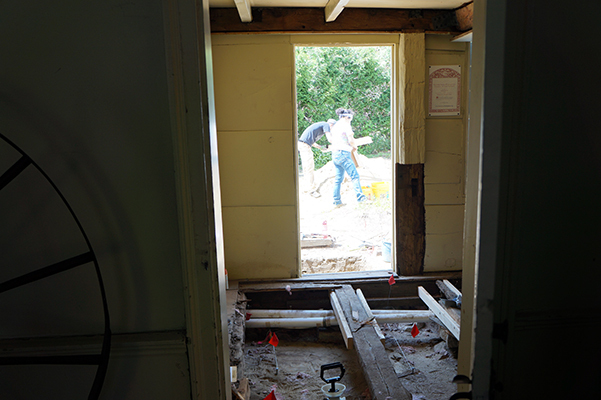 Today, we started excavation inside of the house. Even though this was not a scheduled day, archaeologists Elena Sesma, Evan Taylor, and Mary Larkum, came in to help continue our excavation. Mary processed artifacts in the lab and remarked that she was brushing off (very carefully!) the first mussel or clam shell from this site (I’ll have more to say about this in a bit). Elena and Evan opened our first unit — the squares that archaeologists dig — in the house. Their unit was right in front of the door and immediately next to the house’s stone foundation. Unsurprisingly, they found what appears to be evidence of the trench dug for that foundation. Artifacts from the top twenty centimeters speak to the different people who called this house home: some old nails, some old newspaper fragments, and some sewing pins. They even found a fragment of what appears to have been an old plank for the floor. It was decomposing, but enough of it remained that we could see a flat surface. Like some of us, the inhabitants of this house threw the fragments of their old floor on the ground when they replaced it. Little did they know archeologists would come in the future and discover what they did. It makes me wonder if future archaeologists will discover my children’s old pool that I keep hidden under the deck! Nancy Rexford, the director of Historic Northampton, mentioned that there is a photo — now missing — showing a woman standing in the doorway of what appears to be a summer kitchen. This kitchen is located in the back of the house, exactly the area we are excavating. I have noticed that we are discovering a lot of bones from large mammals — pigs and cow, primarily. We can study these bones and determine which cuts the residents of the house were eating and infer how they were preparing the food. Right now, it looks like they were eating a lot of roasts and/or cuts that require stewing. Given the proximity of the Connecticut River, we are recovering surprisingly little evidence that they were taking advantage of the readily available fish or mussels there. We are getting lots of bone from large mammals. The bone you see here has been left in the ground because it is in the soil. 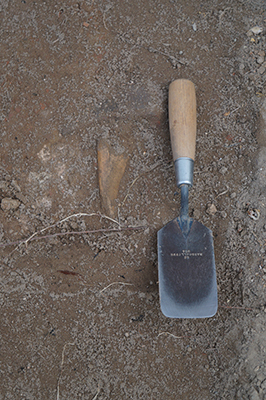 Archaeologists excavate each level evenly and leave artifacts in place that do not come free when we trowel. Elena and Evan screen the soil from their unit, which you can see right inside of the door.